Wales wing George North says Northampton's style of play "isn't really helping my game". The 23-year-old has scored 23 tries in 55 Test matches since his international debut in 2010, but has crossed just three times for his club this season. North is with the Wales team as they prepare for their Six Nations opener in Ireland on Sunday (15:00 GMT). "Wales want to play a quick game and an open game and that suits me down to the ground," said North. "I want to be on the wing. I want to have that space to run at people and have the opportunity, rather than carrying straight into a wall. "Sometimes you need to be that guy, which I don't mind doing. "But when you've got the opportunity to have 50 metres of space and you can open the taps, there's nothing better in the world than doing that." North added he preferred more "freedom". North left Scarlets for Frankin's Gardens in 2013 and signed a contract extension in November 2015. 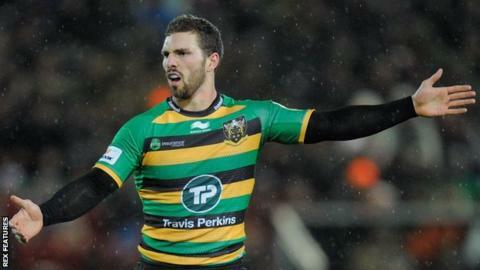 "For me it would be nice to step away from Northampton now, get a different stimulus," said North. North has scored 25 tries in 51 appearances for Saints, 14 of them in 16 games during the 2014-15 season. In 2013-14, his first season at the club, he touched down eight times in 23 matches. Northampton are sixth in the Premiership and have reached the European Champions Cup quarter-finals, where they will face English rivals Saracens. But North is currently focused on Wales as he looks to match the expectations of coach Warren Gatland and backs coach Rob Howley. "Always more is the key. Always one more," said North, who is given a target for the number of times he should touch the ball. Wales have won Six Nations titles in the year after the past two World Cups, and North hopes that run will continue. "We've got great history in the Six Nations post-World Cup year. Hopefully we can continue that," he said. North's Welsh girlfriend Becky James hopes to be part of Great Britain's cycling team at the Rio Olympics this summer. North was asked if he would like to be part of the GB Sevens team for the Games. He said: "I'm hopefully going to go anyway if Becky is selected. "I'll take my boots with me. For me it would be: World Cup pre-season; World Cup, full season, Six Nations, full season. "It might be worth just taking a chill pill - 23 and feeling 44. "I don't even know my schedule for next week, let alone for Rio, so let's see."